He achieved fame for his invention of the Zuntz-Geppert respiratory apparatus in 1886 and the first treadmill (Laufband) in 1889. 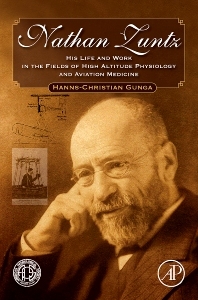 He also invented an X-ray apparatus to observe cardiac changes during exercise and constructed a climate chamber to study exercise under varying and sometimes extreme climates. Physiologists and researchers working in aviation medicine plus anyone interested in the history of medicine. Dr. Gunga has been working in the field of integrated research on humans in extreme environments for more than 25 years. He has garnered financial support from the German Government (BMBF/BMWI/DLR) and established public private partnerships with the Center of Space Medicine and Extreme Environments at the Charité University Medicine Berlin. As a PI, he has conducted several national and international research studies in different laboratories and under field conditions around the world and in space. (e.g. MIR, Shuttle, International Space Station). His team combines scientific research at the academic forefront in different extreme environments with teaching duties at one of the largest medical clinics in Europe. In addition, he has been invited to give lecture courses on human in extreme environments at the Northwestern Polytechnic University in Xi’an (China) in the frame of the ‘High End Foreign Expert Program’ of the Chinese Government from 2012-2016 and recently renewed this contract for an additional three years (2017-2019). Furthermore, in October 2016 he was invited by the Universidad de Antofagasta to give an internet-based lecture, which was officially announced in the frame of the ‘Latin American Network of High Altitude Medicine and Physiology.’ The Chilean Government and the German Academic Exchange Program (DAAD, Bonn) financed this guest professorship. In April 2017, the guest professorship was renewed and will be conducted in October and November this year, again at the University Antofagasta.